Staging your home for sale will help you increase the bottom line and sell the home quicker and for money as it will appeal to more buyers. Home staging is proven marketing technique for selling homes. Here is something you should consider before listing your home vacant. 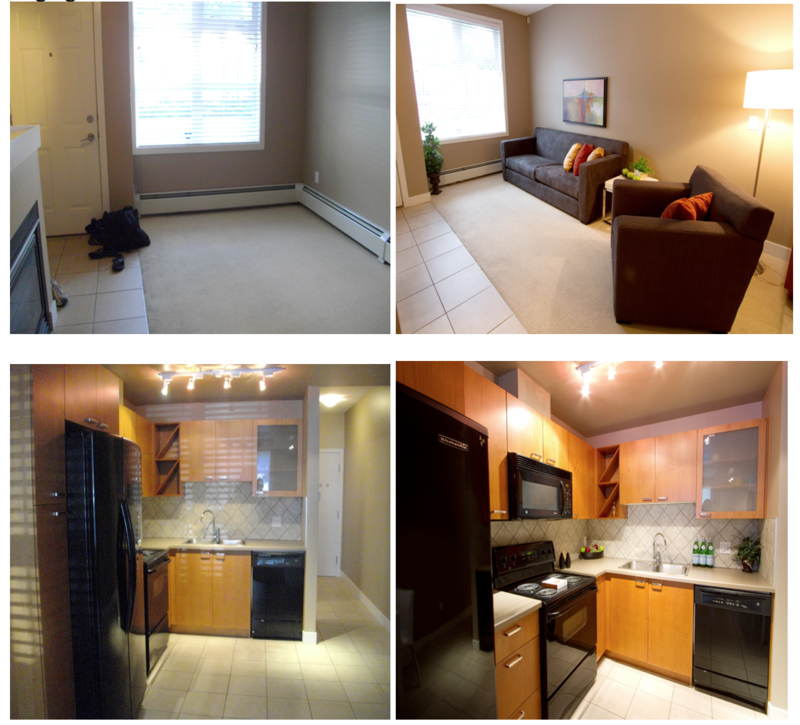 Take a look at our before and after photos of a vacant property we staged in Mission. Buyers were having a hard time visualizing the floor plan and felt the space was too small. After staging this properties sold in 42 days was on the market 210 days prior to staging. Home staging is an important way to increase the equity of your home, or provide value added to your home for sale. Preparing one's home for sale isn't just about dusting, mopping, vacating the home, putting up or hanging a "Home for Sale" board and getting the best agent in town, rather, if you want customers to actually come knocking at your door, you will have to do more than just those. Selling your home or your property as-is will only leave possible buyers passing by your lot without even taking a glance at it. In home retail, a strategic location is not the only factor that affects a buyer's decision. The product presentation actually makes more impact and greater appeal. As many claim – first impressions last. As home sellers, you should aim to get your prospective buyers' interest right at their first visit. In real estate, competition is stiff and is everywhere but you can always step up the game through your strategies in staging your product – your property. Home staging, also known to many as 'home doctoring,' is one of the techniques needed in selling one's home. This strategy only reminds sellers to properly present their product so as to increase the likeliness for possible customers to check their product and eventually purchase it. Always take note that the manner or the way sellers present their homes contribute in every buyer's decision making. In other words, the more impact you create and the more good impressions you retain in their heads, the greater the chances of them writing your address on the shopping cart. In staging your home, the most essential tip is to always highlight the strengths of your property while also downplaying its weaknesses. It will also give you an edge if you are able to make your prospective buyers feel at home in your property for sale. In selling your property, you should also be able to tap your market's emotional side as most possible customers, in fact 95% of buyers, try to look for their sense of belongingness with the product they're trying to purchase. They see the product as their own and maybe some even already start imagining themselves in that home to see if it fits their lifestyle, their needs and even their leisure. Increasing your property's appeal may require you to take some extra effort to clean every corner of the home, repair loose screws or busted lights, rearrange furniture and a whole lot more. These things would only contribute to captivating your buyer's inclination to purchase your home. In selling, you should not stop at attracting the greatest possible pool of buyers through aesthetics and beauty, but more importantly, one must also take into account the financial aspect involved. Sellers always have to remember to keep their price and worth appealing and justifiable. Overpricing will just leaves your property rotting and eventually, it will just leave you spending more in maintaining your product and keeping up with all the extra expenses such as mortgage payments, homeowner's insurance, utility bills and more. Take note to price the product right and get prospective buyers coming non-stop. Presenting your home beautifully and irresistibly will not only attract a bunch of interested customers but also it will also give you right to sell your product for what it's really worth. A survey conducted in 2007 said that 94% of staged homes were, on an average, sold in a month or less. In home selling, always keep in mind that the initial and the most fundamental step is to properly present the product you are selling. Succeeding in this step will eventually lead to a whole lot of prospective buyers taking your product on the top of their choices. Home staging only aims to build your home into the kind of home your buyers are looking for. To your surprise, after decluttering, cleaning and revitalizing your own home into a home welcoming a new set of owners, you'll be able to sell quickly and profitably. I completely agree on the value of staging. It's a great way to minimize flaws and accentuate assets, particularly true in rooms that lack a defining characteristic (i.e. a room that is too small to be a bedroom being staged as a home office). Those before and after shots are amazing! I can see now that staging is not only helpful for those who can't visualize what certain rooms could be used for when they're looking at a property in person, but it's also useful when evaluating photos of a property. That living room is really a classic example of a space you might wonder "what on earth am i looking at" but as soon as you see it with furniture it becomes immediately obvious! Considering an Investment in Hawaii Real Estate?